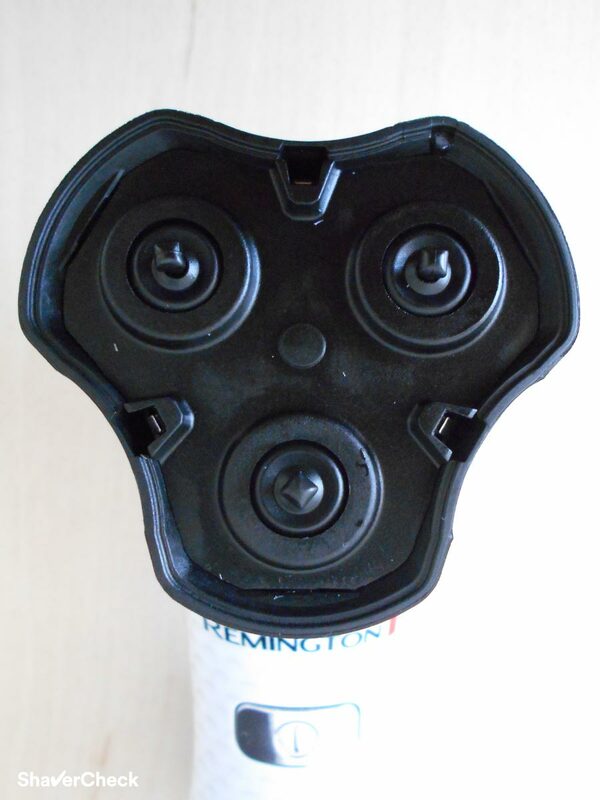 Available in several design variations, the Remington XR1340 HyperFlex limited edition shavers are part of the Remington Your Way collection and are, according to the manufacturer, their best shavers yet. 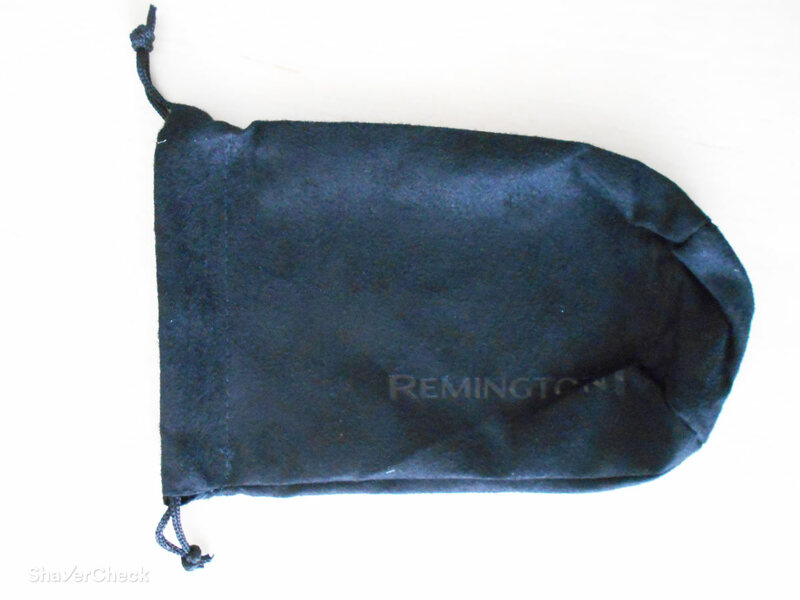 That is a very bold claim and in this Remington XR1340 review we’re going to find out just how good they really are. Without further ado, let’s start by taking a quick glance over the main features. The Remington XR1340 HyperFlex is a three blade rotary shaver that promises to deliver a smooth shave in style. The limited edition shavers — Golf Edition (in this review), American Pride, Gone Hunting, Road Warrior, Technology — are identical in terms of performance to the regular XR1340 HyperFlex shavers. This also appears in the actual name of the shaver, so it has to be a big deal. It refers to the fact that the shaving head can swivel freely to better adapt to the contours of the face. In reality the range of motion is quite limited and you have to press pretty hard for the head to flex. This only refers to the fact that the three individual cutters can flex inwards. 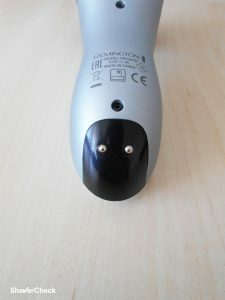 The tracks on the shaving heads have both slots and holes to be able to capture and cut longer and shorter hairs. The actual blades that rotate behind the metal combs are coated with Titanium. Titanium is often used in some applications for its anti-corrosive and edge retention properties. We’ll see later on in the performance section how well these blades shave. Other noteworthy features include cordless operation, pop-up trimmer, wet & dry use. 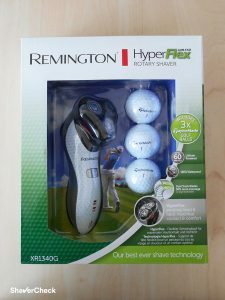 The Remington XR1340 HyperFlex is available in different styles; my review unit is the Golf Edition that features a Golf inspired design. 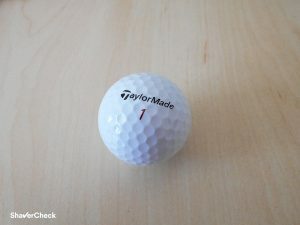 The retail package also includes 3 TaylorMade golf balls. The finishing and build quality of this Remington shaver are average at best. The problems include sharp edges, uneven gaps and poor printing. The plastic used looks and feels pretty cheap, particularly that ON/OFF switch and the shaving head. The included travel pouch is pretty bad as well. It looks and feels like a cheap, plasticky, velvety thing. 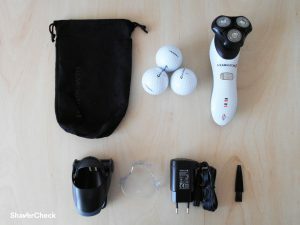 The shaver used in this review was bought from Europe and didn’t include the posh travel bag that appears in some official product photos. And then there are some ergonomy issues. First, there are no grippy rubber surfaces, not even on the sides or on the back of the shaver. 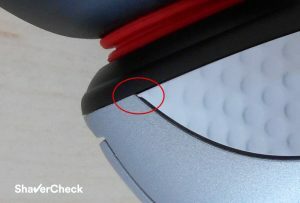 The grey back appears matte but is actually quite slippery, and so is the white glossy plastic that mimics the dimples of a golf ball. 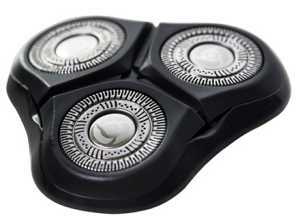 The razor is very light despite its size and this compensate a bit for the lack of grip. Another minus is the lack of a travel lock, very handy when traveling. The included plastic cap is very fiddly to put on, requiring serious pressing and then some adjusting to center it over the shaving head. The pop-up trimmer is almost useless. While its positioning is not that bad, it’s very narrow and the spring that holds in position when deployed is just too weak. This means that it will almost always fold back down again, even if you keep it at a sharper angle relative to the skin. Overall, the XR1340 falls short in terms of build quality and ergonomics. 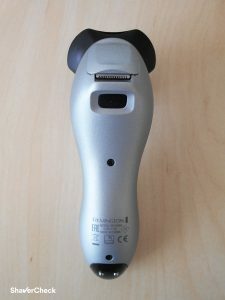 For example, Philips Norelco has shavers that cost half the price of an XR1340 and have superior build quality. But then again, they don’t offer golf balls. 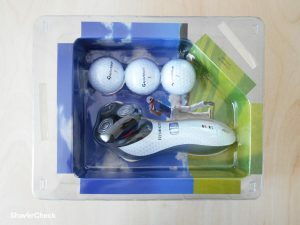 Once you open the box you’ll be greeted with a heat-sealed plastic blister pack. 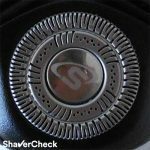 The shaver features a Li-Ion battery that provides 60 minutes of cordless shaving time according to the manufacturer. I found this to be pretty accurate as I got around 50 minutes of use from a full charge. Speaking of charging, it takes a rather lengthy 4 hours to complete, a lot longer than the typical 60 minutes charging time of other similarly priced razors. The LED indicators on the XR1340 are as basic as they come. There’s only a low charge indicator that glows red when the battery runs out of juice and a charging LED light that glows green when the shaver is charging. And this leads us to yet another thing that grinds my gears: the shaver can only be charged via the included charging stand. 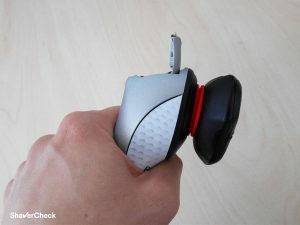 You cannot plug the cord directly into shaver which means that you’ll need to bring along the stand as well when traveling. Also, the shaver just sits in the cradle, leaning against it. 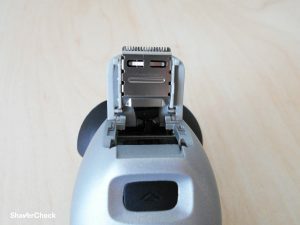 The metal studs on the bottom of the shaver come into contact with the two metal plates on the stand and the battery starts charging. Unfortunately there’s no quick charge option for the XR1340. Cleaning the XR1340 is fairly straightforward. After completing your shave, pull the shaving unit from the shaver — there are 3 cutouts to make prying it with your fingers easier. This will expose the inner housing of the shaver where all the hair clippings are collected. You can tap it gently on the sink, use the included cleaning brush and also rinse it under warm tap water. 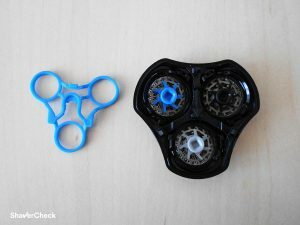 Rinse the cutter assembly as well, then let them air dry before putting the shaver back together. Every once in a while (2 to 4 times a month) you should perform a thorough cleaning. This implies cleaning each inner cutter. 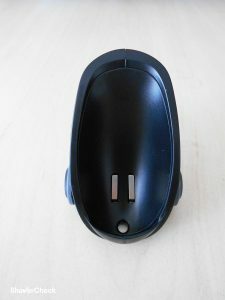 For this, you’ll have to remove the blue retaining bracket by sliding it back as described in the user’s manual. After that you can remove each rotary blade from its comb for a thorough cleaning. Please note that you must place them back in the exact location for optimal performance. 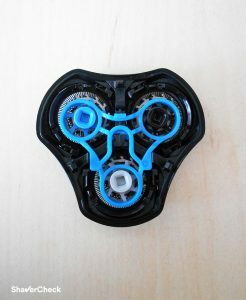 For this reason Remington color coded the hubs of the inner blades to match the corresponding comb. 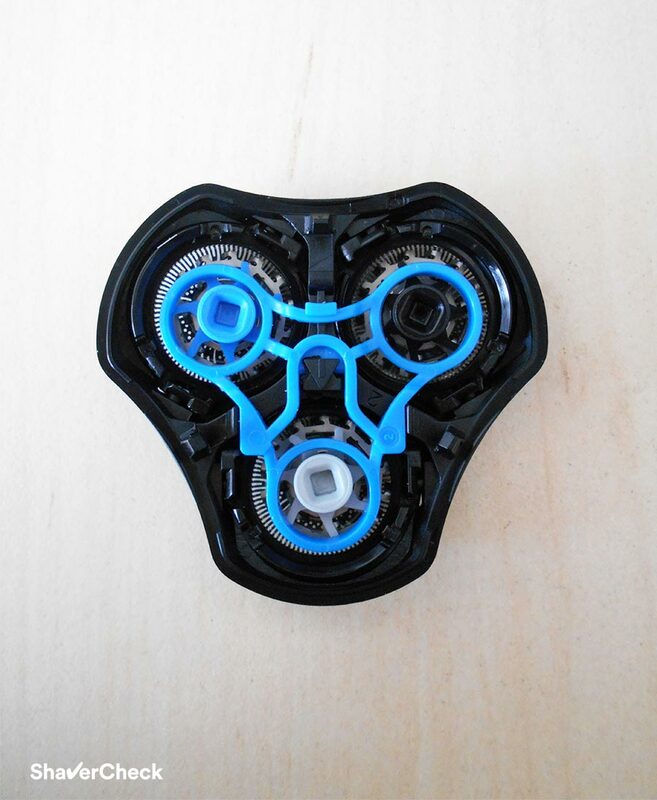 You should also lubricate the inner blades on a regular basis. 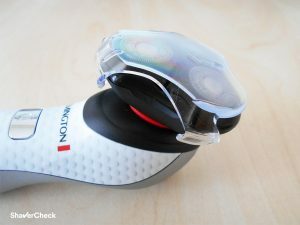 Finally we get to the most important part of the Remington XR1340 review: how well the razor shaves. So far things aren’t looking too bright. Let’s see if it can make up for all these shortcomings with a stellar performance. I’m going to be frank — it can’t. 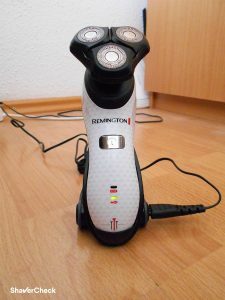 In fact, I can safely say that the Remington XR1340 is one of the worst electric shavers I’ve used in a very long time. The usual expectations from an electric razor include a comfortable and reasonably close shave. Sadly, the XR1340 doesn’t provide either. I used the shaver daily and every two days, for both dry and wet shaving. To put things into perspective, I have medium to coarse facial hair and sensitive skin. Upon using the XR1340 for the first time I noticed that it tends to hop on the skin and it’s pretty difficult to maintain optimal contact with the face without pressing too hard. This is far from an ideal situation. The shaver never managed to provide a decent shave in terms of closeness. I could definitely still feel rough patches when running my hand across my face right after the shave. My beard is significantly thicker on my chin and above the upper lip and the razor really struggled when shaving these areas. It felt underpowered and I even noticed a change in the pitch of the sound as the blades slowed down trying to cut the thicker stubble. Apart from not being able to offer a close enough shave, the comfort during and after the shave was pretty bad as well. Shaving my neck was particularly frustrating. Apart from the occasional yanks, it would pinch the skin and also leave behind flat-lying hairs. Pressing harder only resulted in greater discomfort and I almost always had to follow-up with a better shaver to clean the remaining patches of hair. The post-shave comfort was pretty bad, with a constant stinging sensation, especially on my neck. 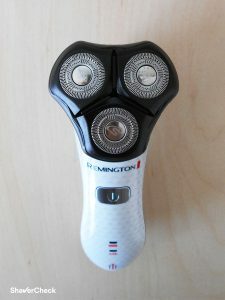 Using the Remington XR1340 with shaving cream does improve the comfort, but it’s still far from a smooth, close shave. Unfortunately as far as shaving performance goes, the XR1340 failed completely. And this was in the case of relatively short facial hair, I definitely wouldn’t consider using it on a longer beard. You can buy pretty much any parts for the XR1240 HyperFlex: plastic cap, charging cord, charging stand, hair pocket and, of course, blades. 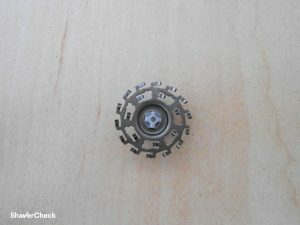 The head and cutter assembly part number is SPR-XR14. Sadly, I cannot objectively recommend this shaver to anyone, particularly for the price you pay. There are better rotary (and foil) shavers out there that leave the XR1340 in the dust performance-wise and some of them even cost less and have vastly superior build quality. 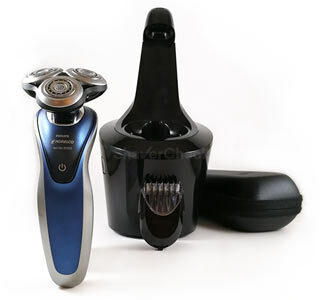 The Philips Norelco 6100 is the first option as it’s one of the best performing rotary shaver in this price range. 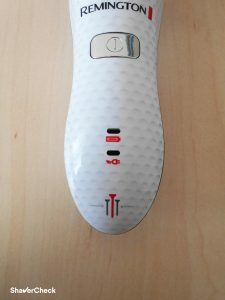 It shaves closer and with greater comfort and features a decent click-on trimmer. The downside is that it can only be charged with the included stand. You can read our full review of the Norelco 6100 here. 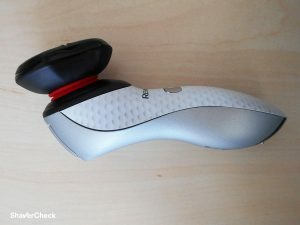 Philips Norelco 4100 is an excellent entry-level rotary shaver that can be used wet and dry and offers great value for money. It provides closer and more comfortable shaves, particularly when used on shorter facial hair. You can check out our review here. 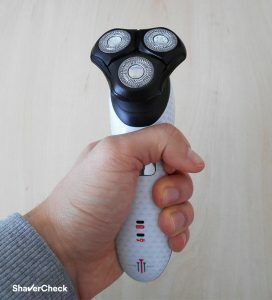 Finally, if your budget allows it, you can go for a more advanced rotary shaver. My personal pick would be the Philips Norelco 8900 as it offers premium features and performance at a somewhat reasonable price. If foil shavers are also an option, you can check out our recommendations here to find one that suits you the best.